We all remember bouncing on traditional trampolines as kids. You know, the rectangle ones with springs around the edges that inch their way from one end of the yard to the other with every bounce. Though they provided hours of fun, there is now an increasing demand for a safer, more stable trampoline design that doesn't rely on springs, such as our brand new Thunder. The BRAND NEW Vuly Thunder - lateral bouncing and no twisting! How do trampolines work without springs? By using a type of rod that sits under the rim of the jumping area. These rods flex under the pressure of the user and when combined with the flex of the jump mat, give the user a steady bounce. With elastic bands that are used in place of traditional coil springs. These bands are usually made of thick material and are difficult to stretch by hand. Our new Thunder is different. It's the first soft-edged trampoline in the world to use Leaf Springs instead of coil springs to power your bounce. Traditionally used in heavy truck suspension systems, the three leaf spring system absorbs the impact of force to provide a bounce that is even better than that of a traditional spring trampoline. Why do people buy a trampoline without springs? It used to be far too easy to land on a trampoline's springs, which would then pinch your skin or quickly burn you on contact if they'd been in the sun all day. So, many people are now seeking a safer alternative for their children – one without the hazardous springs they remember. Here at Vuly we have made safety the primary concern of Vuly Classic and Thunder, which both use the best technology, with and without springs, to minimise impact, protect joints and ensure bouncers are fully enclosed. The rust, wear and tear, and missing springs on products of old were unsightly and made people despise the haphazard look of their backyard trampoline. It seemed as though the logical remedy to this situation was a trampoline without springs, but there have been many advancements in backyard trampolines to combat these issues. Vuly Classic's springs are covered by our unique reversible Safety Pads that be flipped between Green Funky Free print and Classic Blue, which are proven to be more fade-resistant than orange, pink, red and yellow. The Thunder is a step above the expected standard of springless trampolines; with a sleek design and beautiful features, it will be the envy of your friends and neighbours. Those people who want a lower rebound tend to choose this type of design because its bounce height is much smaller than that of devices that rely on springs. Although they do produce a bounce, the lower rebound rate may be more comfortable for those who don't enjoy a high bounce. However, this may prove to be frustrating for trampoline enthusiasts who prefer to jump high. What should you know about buying a springless trampoline? 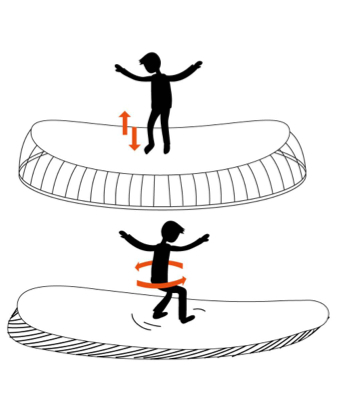 Many users have found that trampolines made from rods are difficult to bounce on. The rebound benefits of this trampoline design are much lesser than those of traditional spring trampolines as they require a much higher amount of force to produce a strong rebound effect. For this reason, it may difficult for children to use some models without springs; they just don't have the body weight to launch from. Strict designs in some springless trampolines often cause a low rebounding height. They're unable to be modified easily because of their design confinements, unlike trampolines with springs that can be easily tweaked to improve performance. The components of springless trampolines are often less durable than conventional spring designs. Most springless trampoline companies are third-party importers who don't regularly keep replacement parts in stock. Both Thunder and Vuly parts are covered under warranty and offered at half price for life. Elastic band trampoline components are often damaged by the sun, which makes them brittle and leads to breakage. Broken bands may cause instability and make the trampoline imbalanced, and may produce a whipping motion that injures either the jumper or those nearby. It's crucial for springless trampoline owners to monitor the condition of the elastic bands to ensure that they're operating at the optimal level. Similarly, fibreglass rod components are subject to the same sun-related damage. Though they are proven to be more durable than elastic bands, the rods may still deteriorate and become unsafe within a few seasons of weather exposure. A snapped rod may cause the trampoline to shift unexpectedly and launch the user off of the trampoline. Trampolines without springs eliminate the possibility of spring-related injuries, but some designs pose more risks than those with traditional spring designs. Fibreglass rods may cause serious damage, both to the user and inquisitive onlookers. The rotating motion of the rods can put strain on the jumper's limbs, and hands or limbs placed between the rods while someone is jumping can be seriously injured. You should ensure that users and onlookers around the springless trampoline are managed at all times to avoid injuries. Unlike designs that use safety pads to protect users from the metal hardware, trampolines without springs don't have safety features to protect users from the rebounding components. The fibreglass rods and elastic bands are exposed to children and pets at all times. Please carefully monitor your loved ones to ensure they don't end up with an injury caused by a trampoline. Finally, while springless trampolines tend to have lower shipping costs, many trampolines without springs cost more than those with metal hardware. Their complex manufacturing costs result in a very costly investment for most buyers. The revolution has arrived. Combatting any and every safety concern mentioned above, Thunder is the safest no spring trampoline - well, no coil springs anyway! Using new leafspring technology, you'll want to find out about what a Thunder in your backyard would mean for you, or view our full trampoline range.